The following is the first installment of a TrueHoop post that was originally published to TrueHoop subscribers on Tuesday, April 9. More of the series in the weeks to come. It’s a story about the oddity of LeBron as a co-worker, how he made it to the NBA, his beliefs about getting things done. It’s about his superpowers and his work ethic, which taken together define him as the best basketball player of all time. And, for many teammates: difficult. It’s a story that means everything to the NBA’s almost comically successful showpiece team, the Los Angeles Lakers. In a triumphant coup, they signed LeBron last summer, banking on him to lead them back to their former prominence. The Finals is two teams; the NBA is 30. In the Lakers’ 71 years, they have been to the Finals 31 times, winning 16 titles. The last few years have been a different story, however: The Lakers have missed the playoffs more times in the last six years (six times) than in the team’s first 65 years combined (five). The team’s assets to improve are 1) LeBron James, who signed for three more years, 2) a market with great appeal and revenue, 3) cap space that might lure a big-name free agent, and 4) a pipeline of young players that includes Lonzo Ball, Brandon Ingram, Kyle Kuzma, and, other than two second-rounders, all their future draft picks. No. 4 is the worry point. Young players need discovering, nurturing, inspiring, forgiving, and tending. It’s not a process the Lakers have down. Their recent castaways—D’Angelo Russell, Julius Randle, Ivica Zubac—are among the league’s most admired emerging talents. Meanwhile, LeBron has spent much of his career on some of the oldest rosters in the league, out of his ardor for proven veterans like Mike Miller, James Jones, and Ray Allen. A rare exception was when James returned to Cleveland from Miami, joining a young team. He had a kind of slow-motion public meltdown, subtly sniping at teammates on Twitter (“#petpeeve”), taking a midseason break in Florida, and eventually addressing matters by taking over the offense without consulting the coach. In December, James told ESPN that playing with New Orleans Pelicans center Anthony Davis "would be amazing, like, duh. That would be incredible." The sole means the Lakers had to get Davis was to trade away many of the young players in the Lakers locker room. "The only players whose play hasn't been affected by the trade talks are James and Rajon Rondo," a team source told ESPN. Anyone who watches James closely understands the complaints of those young teammates. His body language often seems to suggest they simply aren’t good enough. Why does the biggest name sweat the smallest stuff? Because of all the sweat it took to get this far. The player at the center of Spike Lee’s 1998 basketball movie He Got Game is named “Jesus.” When the movie begins, he’s only 12 and seeking his own salvation: His mom is dead. His dad (played by Denzel Washington at his surliest) killed her and is usually either locked up or half-cocked. The belief that the slightest rest spells doom is the hallmark of many great athletic careers. It’s also obsessive thinking. This is a TrueHoop series about LeBron James. He is not only one of the biggest, fastest, and strongest humans in history, but he also has a brain wired for obsessive work. He is exceptional in both body and mind; born enormous and strong, and with an immense capacity to work to get stronger. That’s how to build the best individual player in the history of the game. His determination to outwork everyone comes with many things, one of which is a certain narrow brand of intolerance. LeBron is tough on himself, and that affects those around him, especially young teammates who can’t match his professionalism. He has ridiculed or quit on plenty of young teammates, it’s hard to name many he has successfully nurtured. Less than a year ago he became a meme of angry disdain after J.R. Smith misconstrued the score in crunch time of Game 1 of last year’s Finals; that night LeBron would profoundly injure his hand punching a whiteboard in disgust. LeBron is the best at so many things, but getting the best out of young players has never been one of them. The Milwaukee Bucks’ Eric Bledsoe was tossed in the opening minutes of a game last week in Philadelphia for attempting to shatter the 76ers center, Joel Embiid, with a hurled ball. Bledsoe’s absence rattled the Bucks. With a few minutes left, to the delirium of the Philly faithful, the 76ers held a slender but meaningful lead. But the Bucks star and likely league-wide MVP, Giannis Antetokounmpo, had perhaps the best game of his life, and the Bucks hit the big late shots and dispatched a key conference rival. By the time the team hit the showers, there was a good feeling among the Bucks. Sure, the visitors’ locker room may have been a little threadbare, tattered carpets, nothing close to a window. The showers, around some steamy corner from where the team dressed, barely seemed to have lights at all. But this team had stared adversity in the face and come away with a mathematical lock on the best record in the NBA. Teams like that sometimes win titles. If the NBA is a dreamland, to be in a room like this, feeling that, is awfully close to the dream. This is why kids linger on the playground at recess, after the bell, hoping to sink just one more longball. How do you get there? How do you make the NBA? If you could peer into the hearts of everyone around the league, and see their thoughts, this would surely be the top-ranked question. How can you get into that room and be part of that? The honest answer is that you can’t. Close to a billion people watch, play, or follow basketball in some way around the globe. Fewer than 500 put on an NBA uniform in a typical season. You could say NBA players are one in a million, but by those rough numbers, it’s more like one in 2 million. About one in 325,000 Americans is a U.S. Senator. It would be a more realistic plan to be an astronaut or President. The idea has long been that there is only one exception: to have a truly unusual (and especially: tall) body. In one study, roughly a fifth of the Americans who are seven-feet tall, and of appropriate age, are in the NBA at a given time. Brook Lopez is seven feet tall and the Bucks’ starting center. As a tribute to the ways height trumps odds, not only did Lopez make the NBA, but his twin brother Robin did too. Brook emerges from the showers needing multiple towels to give his torso a little privacy. Being seven feet tall isn’t the only way to make the league, though. "Another, grittier way: have an outrageous capacity for work and for avoiding people, habits, and substances that keep you from that work. Some people have bodies that are NBA-perfect and minds that are good enough. Some people have minds that are perfect to get the most out of a body that’s good enough. As he dressed, it was this latter category that Lopez discussed. Lopez knows a lot about what works in basketball. One of the best bodies in NBA history, Antetokounmpo’s, was only a few yards away. Lopez played with Kevin Garnett and Vince Carter, as well as for Magic Johnson and Jason Kidd. Everyone in the league has an astounding capacity for work. Go down the list of 6-foot-4ish hopefuls at the combine with Connaughton, and you’ll see that as it is in the numbers, so it is in the stories: Almost nobody makes the NBA. His compatriots are now on teams like the Herd, Hustle, and the Blue in the G-League. Or they’re overseas at Dinamo Sassari, Telekom Baskets Bonn, or in the Turkish Basketbol Super Ligi. Not long after that combine, Connaughton was drafted 41st overall and then played a grand total of 143 minutes all season for the Blazers. Both numbers are huge accomplishments, both numbers predict a career likely to end. But Connaughton has been expecting and prepping for the challenge of keeping his NBA job since middle school. He works to keep his career every day, and as a result, that night in Philly he had just logged 31 minutes and 23 seconds for the best team in the NBA. Connaughton wouldn’t even let me finish the question. This was a first. Wait, it never happens? Other than a few weeks of rest after the NBA season, Connaughton says he takes no days off. No questions asked? Harsh. Heroic. Bewildering. And what got him here. The process of making himself athletic enough for the NBA made him athletic enough for just about anything. As a baseball pitcher, he had a fastball in the mid-90s and was a fourth-round draft pick by the Baltimore Orioles who still hope Pat might resume playing baseball. I joke that he should go on the TV show American Ninja Warrior, and his curt reply that his GM might not like it makes me feel like he has considered it. Wait, that’s literally how their relationship began? With Pat straight up challenging a new coworker to a contest? I ask Connaughton who else in the league feels like he does about working out. For a while he struggles to come up with anyone, saying only “that’s a good question.” Finally, he mentions Giannis, who he says is “side-by-side with him” in a lot of workouts. I’d nominate one other: LeBron. In some ways, he’s Brook Lopez and Pat Connaughton. He is not as tall as Lopez but has a body perhaps even more rare, with—as we’ll discuss later in the series—wiring like Connaughton’s. Both Connaughton and LeBron fight the anxiety that if they take it easy, they’ll become obsolete or unemployed. You might laugh. Does LeBron really think that? It’s not always bad. You ever see a twig and think it’s a snake? You are wrong, and look silly for a moment—but that kind of vigilance is natural selection in play on humankind; those without it more often died of snakebites. “In milder forms, this kind of worry can be preventive—the student who is worried enough about the test to study harder is likelier to do better than the student who knows she’s smart and trusts that she’ll do well,” writes Saltz. It’s not true, of course, that Jesus must work out while everyone else is sleeping (on the contrary, exercise scientists see sleep as a performance wonder drug). But it can feel that way. Anxiety is about doing a poor job of evaluating threats. If you think missing a workout will doom you, you won’t miss a lot of workouts, and might become elite. But you might also see doom in other things, as many elite athletes do. Rafael Nadal arrived to the top of tennis believing he could only step over a line with his right foot, not his left. Between points, he believes he has to do something bizarre to his crotch. He lines up his sports drink and water bottles ever-so-precisely courtside at every match. He’s “ordering my surroundings,” he writes in his book Rafa, “to match the order I seek in my head.” This brain misperceives what really is and is not life or death. And that might be what drove him to be so good at tennis. Deadly NBA shooter J.J. Redick finds the world so chaotic that his uber-organized closet is, he tells The New York Times, “his happy place.” He still seethes about a day in 2013 when his room service was 20 minutes late. He doesn’t want to know what will happen if he goes a summer Sunday without making the exact same 342 shots. Not 343. LeBron is following in the footsteps of Jesus Shuttlesworth himself; longtime NBA player Ray Allen is the actor who played the role of grown-up Jesus in He Got Game. One of the best shooters of all time, thanks to thousands of hours honing his craft, he is famous as the NBA’s obsessor-in-chief, on and off the court. When Ray’s college roommate Travis Knight once left dirty dishes in the sink, Allen was so rattled he put the filthy plates in the poor guy’s bed. In 2014, a microphone caught LeBron, in a Heat huddle, telling his teammates: “Ever since I saw He Got Game, I thought he could do no wrong.” James is talking about Allen, by then a real-life teammate, whom people still call Jesus Shuttlesworth. Just then Allen walks by, and James hollers “Keep going, Jesus,” pronouncing the name in Spanish (“HAY-soos”) as the two slap hands. Of course LeBron loved the movie. It’s on every list of the best basketball movies ever, and unlike Hoosiers, Space Jam, and White Men Can’t Jump, it has a racial perspective that feels genuine. When He Got Game came out in 1998, LeBron was impressionable, 13, and very like Jesus: planning to overcome an absent father and long odds through hard work at basketball. Pam Walker remembers that LeBron shared a room with Frankie, and she often had to ask Frankie to clean his half of the room. But LeBron’s half was tidy. “They put the discipline act into me,” said LeBron. The discipline knows no bounds. LeBron told ESPN interviewer Rachel Nichols that he was too cheap to pay for the commercial-free version of the music app Pandora. He hates to pay data charges. Even in the second half of huge playoff games, the camera will sometimes catch him tucking in his uniform shirt just so. When you see the character of young Jesus on the court, you want to tell him, “Just keep going. It’ll turn out all right.” And if they’re making a movie about him, and he’s a basketball player, it probably will. But the whole point is the odds are long. In real life, a player like Jesus ends up at an AAU tournament where there are ten players as good, and some of them are bigger, stronger, and meaner. Even at a tender and impressionable young age, there’s a real physical battle to win, and then another one. Year after year, with talk of life or death and lifting your family from violence, drugs, and poverty. Many fall off the path. Those who don’t emerge from the battles with scars—very often the conviction that even a tiny bit of slacking is death, or close. This is obsession, the most under-told story in sports. David Thorpe insight and picks. Sign up before 7 p.m ET and you can play along with experts in the TrueHoop Stat Geek Smackdown. Watch Thunder vs. Blazers with us on Sunday afternoon. In the weeks to come: further chapters on LeBron and Prokhorov. 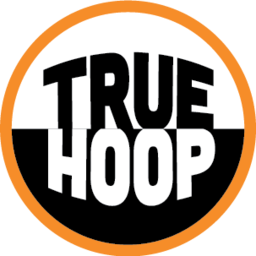 Did you know that TrueHoop's group subscribers get the best rates?